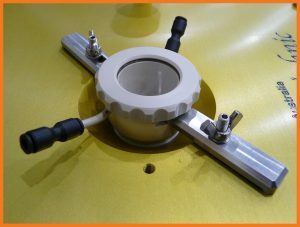 Exclusive for RESOlution Laser Ablation Systems, the Laurin Technic S155 laser ablation cell was developed by Michael Shelley, a pioneer in LA-ICP-MS development and formerly of the Australian National University, Research School of Earth Sciences (ANU, RSES). Its design incorporates many sophisticated features that combine to deliver excellent results. The S155 is the only constant volume, dual volume sample cell available on the market. This unique design ensures that your sample reaches the ICP as quickly and efficiently as possible. 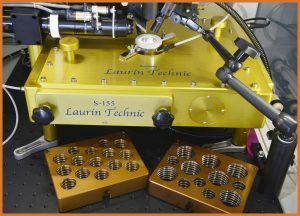 The S155 Laurin Technic laser ablation cell incorporates the same advanced features as the earlier M50A sample cell, with over six times the accessible area. Samples in the cell are imaged using a motorised off-axis viewing system and a high resolution camera, all effortlessly controlled via our GeoStar software. All gas controls are completely automated, making sample exchanges easy and safe for the torch. Gas operations are customised to specific ICP requirements using a powerful scripting language. To assess how this cell will revolutionise your research, please contact us for more information.